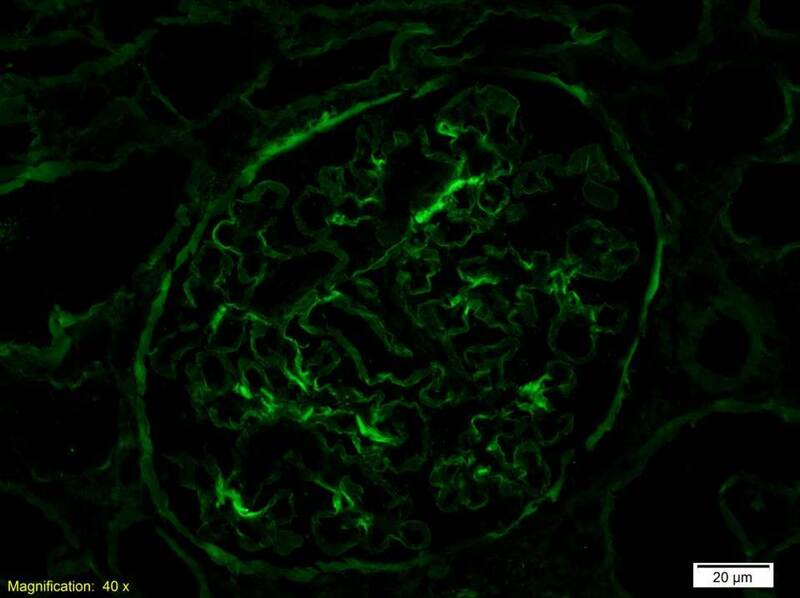 A woman in her early 30s presented to the renal clinic with sudden onset edema. Her urinalysis revealed 4+ protein and 3+ blood. Dysmorphic red cells were noted on microscopy. Apart from her edema, she had no other significant symptoms or physical findings. Her serum creatinine was 0.8 mg/dl and her albumin was 1.6 g/dl. Her serologies were entirely negative. The protein/creatinine ratio was 6 and 9 on two occasions. 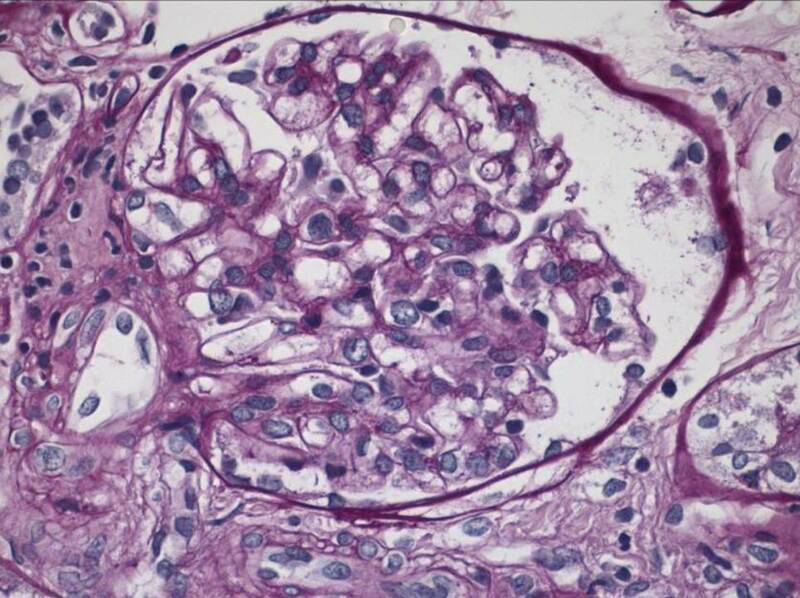 The presumptive diagnosis was IgA nephropathy and she proceeded to a renal biopsy. 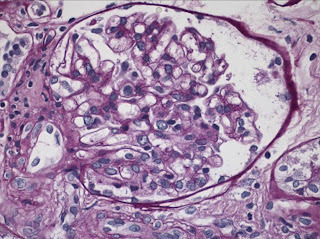 Her glomeruli looked normal with no evidence of inflammation or mesangial expansion. There was no staining for IgA. 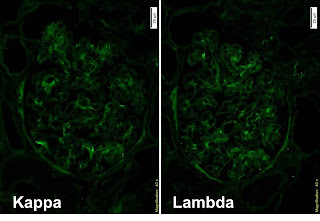 There was minimal IgG staining with equal kappa and lamda. EM showed diffuse effacement of the foot processes consistent with minimal change disease. 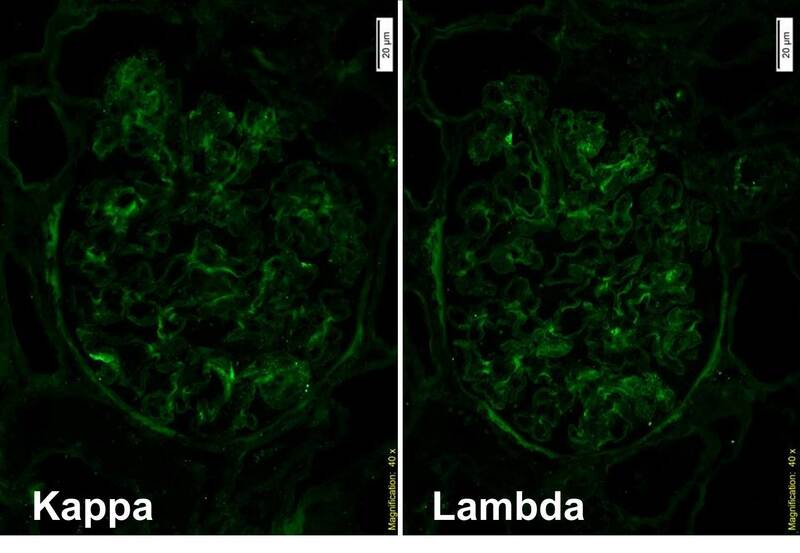 But, why did she have hematuria? The answer is revealed by looking closer at the basement membranes. The harmonic mean thickness of the BM was 196nm which is diagnostic for thin basement membrane disease. The hematuria in this case was a red herring - her acute diagnosis was minimal change disease and she simply had not previously been noted to have hematuria. TBMN is the commonest cause of persistent hematuria, present in about 1% of the population. It has a benign prognosis and is associated with a positive family history. It can sometimes be difficult to distinguish from forms of Alport's syndrome early in the course of the disease. It results from heterozygous mutations in the COL4A3 and COL4A4 genes. Interestingly, the penetrance of hematuria is only 70% so the absence of a positive family history of hematuria does not definitiely suggest a de novo mutation. 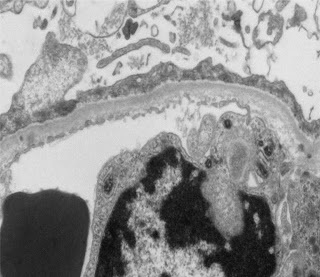 Episodes of macrosopic hematuria can follow an acute infection and thus mimic IgA although this is relatively rare. One of the bigger issues is making the diagnosis and criteria and measurement techniques vary by institution. There is no specific treatment required although patients do need to be followed up as there are some atypical cases of Alport's syndrome which can present similarly but are associated with progression. Some have advocated treating patients with ACEi to prevent episodes of hematuria but the evidence for this is not strong. 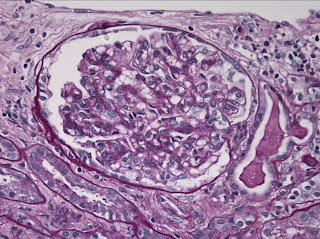 Patients with TBMN can be kidney donors although they should have a renal biopsy first to make certain that there is no other diagnosis. Here is an excellent review from 2006 and more recently, expert guidelines on the management of Alport's and TBMN were published in JASN. 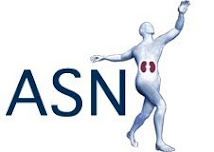 THE ASN-Affiliated and NIH sponsored NATIONAL COURSE FOR RENAL FELLOWS: ORIGINS OF RENAL PHYSIOLOGY course welcomes applications from renal fellows. 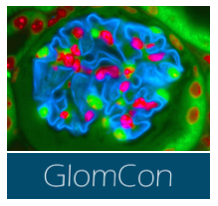 The one week course (8/31/13 - 9/7/13) provides an intensive hands on laboratory experience which teaches classical physiology coupled to modern cell and systems biology. 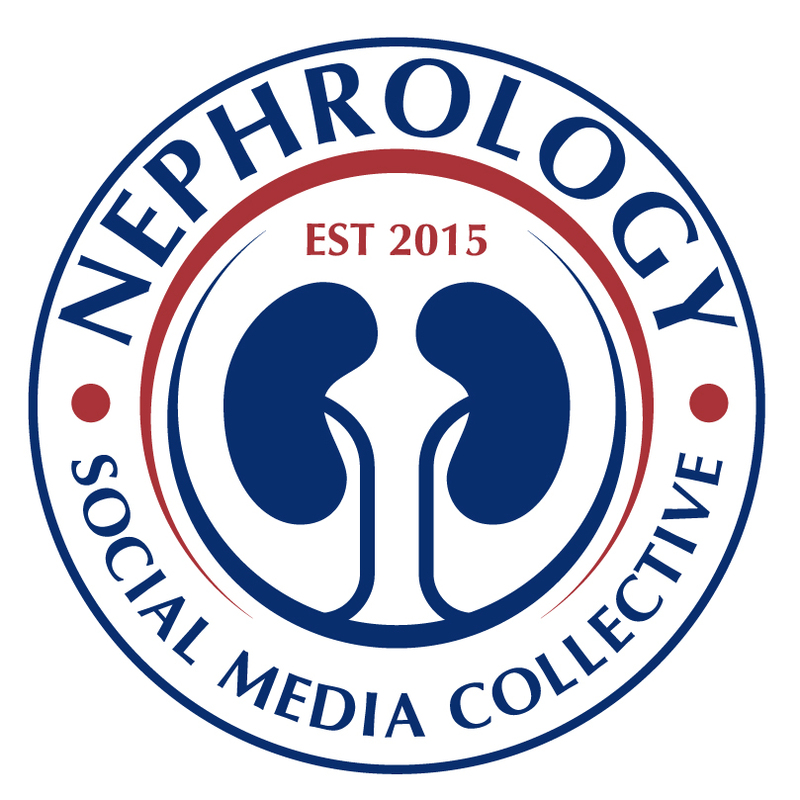 The perspectives the course develops are ideally suited both to renal fellows who seek a career in investigation, as well as renal fellows who plan on a career as clinicians or clinician educators. The course has received absolutely outstanding reviews from all of its trainees, over the past 7 years. 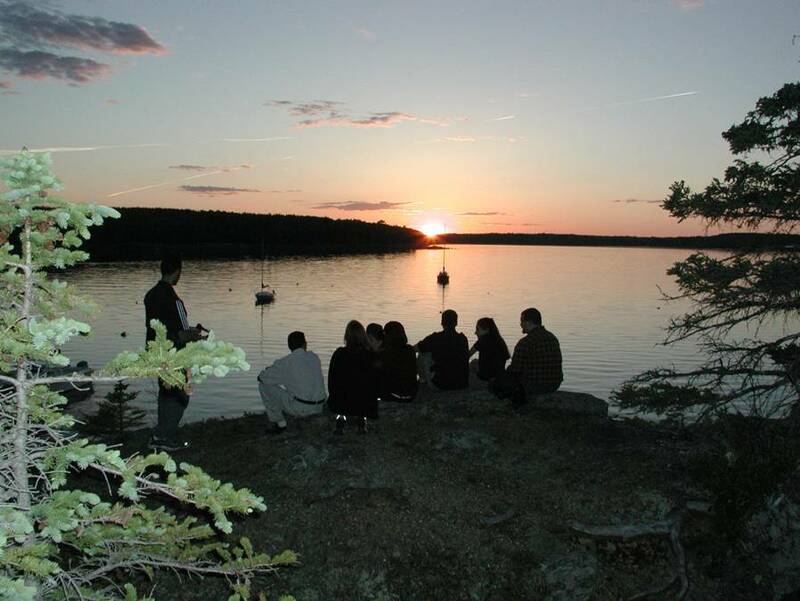 With generous NIH support, the course is offered tuition free, and room and board at the seaside Mount Desert Island Laboratories are also free. The only cost is transportation to and from Boston; course organizers will help get all trainees between Boston and Maine. 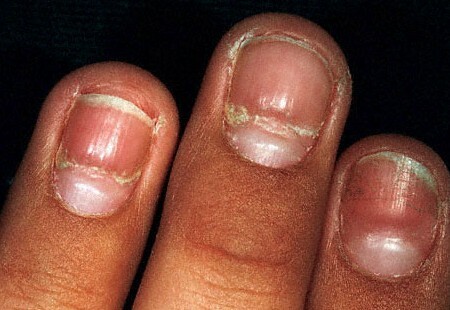 Half and half nails (Lindsay's nails) can be found in patients with any degree of azotemia. The prevalence is about 21% in dialysis patients. the proximal half of the nail is white and the distal half is brown or pink. This color does not fade with nail pressure. The pathophysiology of the changes is not well understood but is thought to be due to increased beta-melanocyte stimulating hormone in the nail bed. This does not improve with dialysis. 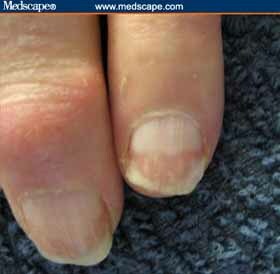 Other changes are also seen in the nails of dialysis patients. Beau's lines are characterized by transverse deep depressions. Mee's lines have a single white band in the nail plate. Terry's nails present with the proximal 2/3 being wide and pale with the distal 1/3 narrow and red. This is the final post in the series on skin lesions in dialysis patients. Historically there was a lot of overlap in terminology between these disorders. Acquired perforating dermatosis classically presents with severely pruritic follicular hyperkeratotic papules, sometimes umbilicated, on the hair-bearing limbs of adults. Generalized papules may also be seen. 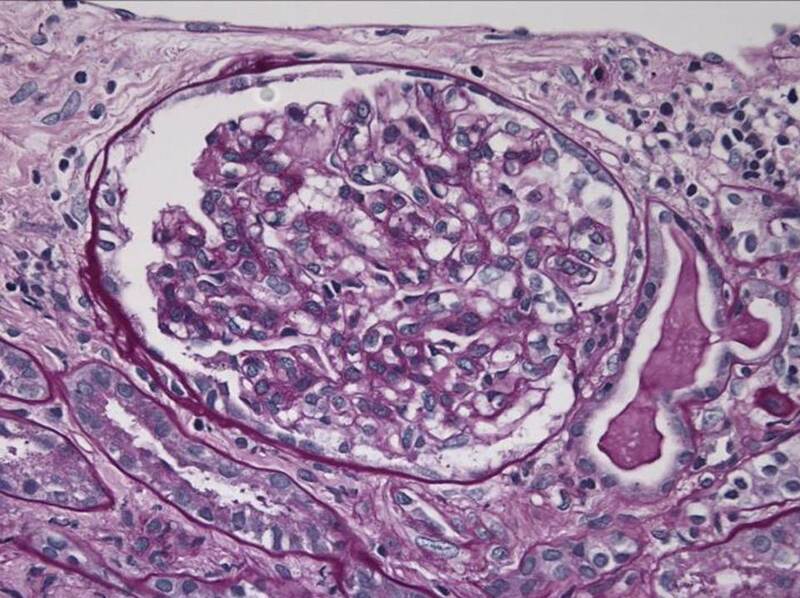 Acquired perforating dermatosis is a chronic disease, usually associated with diabetes mellitus or renal failure or both. In patients receiving dialysis, acquired perforating dermatosis occurs in about 10% of patients. It is also rarely associated with liver disease, malignant disease, hypothyroidism and HIV. Skin biopsy is required to diagnose APD. This reveals epidermal invagination or dilated hair follicle with a keratotic plug of keratin, collagen or elastic fibres and neutrophils. The pathophysiology is not well understood. Topical and systemic retinoids, topical corticosteroids and keratolytics, UVB, psoralen and UVA, allopurinol, cryosurgery and photodynamic therapy have all been considered in the treatment of this disorder. The first cases of this disorder were noted between 1997 and 2000. Nearly all have been in patients with gadolinium exposure. Most of these patients had severe CKD or were on dialysis. The onset of NSF post gadolinium exposure ranges from 2 months to 15 years. The risk of NSF in dialysis patients has been reported as between 2.5 and 5%. Most centers have stopped using gadolinium if the GFR is less than 30ml/min/1.73m2. Starting or increasing EPO dose has also been associated with NSF. This disorder is a systemic disease. Skin disease typically presents with symmetrical, bilateral fibrotic, indurated papules, plaques or subcutaneous nodules. Lesions start in the hands, feet and ankles and move proximally. Rarely are lesions found on the abdomen and the head is spared. Lesions are edematous and may look like cellulitits initially. Sharp pain, pruritis and burning are also a feature. Joints lose flexibility due to fibrosis. 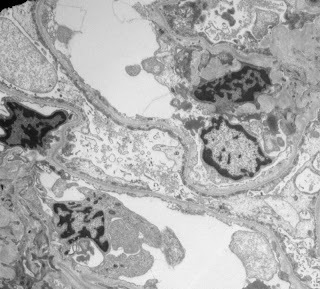 Histological findings are variable: Increased dermal cellularity, CD34+ cells with tram tracking, collagen bundles, septal involvement and osseous metaplasia are typical findings. A comprehensive screen for other causes of severe skin disease is important. NSF has a poor prognosis and one review of the literature suggests a mortality of 28%. There is no treatment for NSF other than recovery of renal function. The preventative measure of avoiding gadolinium exposure in those at risk has significantly reduced the incidence of NSF. A good website by The International Center for Nephrogenic Systemic Fibrosis Research (ICNSFR) can be found at http://www.icnfdr.org/. Though adult nephrologists infrequently encounter these disorders in clinic, the Board Exam loves them. 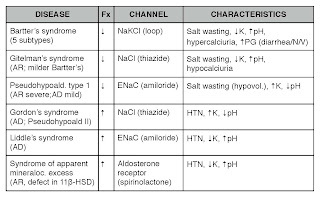 Below a short table describing some of these gain- and loss-of-function channel disorders that are worth remembering. 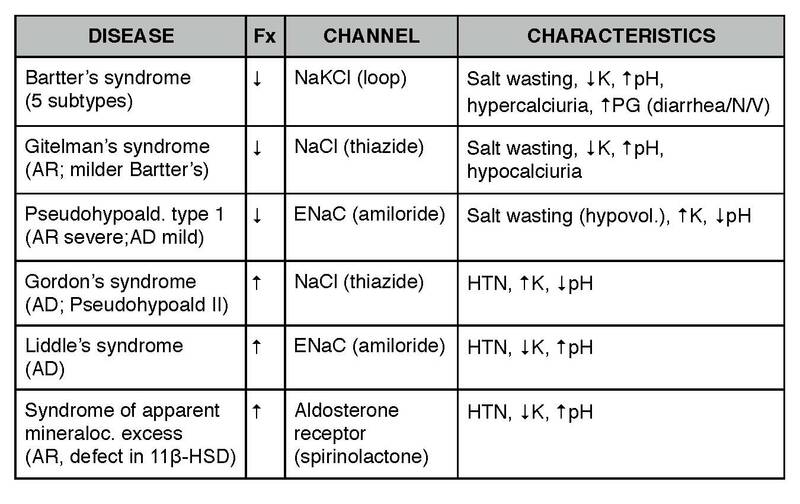 The diuretic-targeted channels are shown under parenthesis as a reference.